When Britain declared war against Germany on 4th August 1914, its army was tiny compared to other countries where men were forced (conscripted) to join the army. 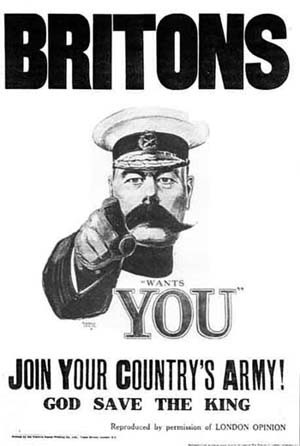 While many famously expected the war to be 'over by Christmas', Lord Kitchener, the newly appointed Secretary of State for War, was unconvinced. He decided to ask for volunteers aged between 19 and 30 to sign up and form units known as 'the Pals Battalions'. This scheme placed men from the same area in a battalion together: knowing other people in the army would ease the mind of some recruits. The scale of the response was astounding, with around 30,000 men enlisting every day by the end of August. Civic pride and community spirit prompted cities to compete with each other and attract the greatest possible number of new recruits. Immense social and peer pressure soon replaced the early enthusiasm however as Christmas passed and casualties rose - military service soon become more of a duty than an opportunity for able-bodied men.